The flag of the state of Arkansas is a U.S. state flag with a very interesting history and meaning behind it. The current state flag of Arkansas is rectangular with a red background. In the center of the flag is a large white diamond with a blue border. Twenty-five white stars appear inside the blue border. In the center of the white diamond, the word “Arkansas” appears in blue capital letters, with one blue star above and three blue stars below it. Although the current version of the Arkansas state flag was adopted on March 16, 1924, Willie Kavanaugh Hocker designed Arkansas’s first state flag in 1912. In this year, the Daughters of the American Revolution’s Pine Bluff chapter decided to hold a contest to develop a design for Arkansas’s state flag. Willie Hocker, who was also a member of the Pine Bluff chapter, won the contest. The original design for the Arkansas state flag is similar to the current version, but in the original version, only three stars appear, all in one line, in the center of the white diamond. The word “Arkansas” was not included in the original design. Arkansas’s Secretary of State Earle Hodges requested that Hocker add the state’s name to the flag, and Hocker complied, rearranging the stars so that one blue star appeared above “Arkansas” and two appeared below the name. The Arkansas state legislature adopted this version of the flag was adopted on February 26, 1913. In 1923, for only one year, a fourth star was added above the state’s name. These four stars represented the Confederate States of America, and the three countries Arkansas has been part of: Spain, France, and the United States. In 1924, the Arkansas State legislature moved the fourth star below the word Arkansas, and rotated it so that the top point of the star faces downward. The flag’s images have deep symbolic meaning. The diamond in the center of the flag represents that Arkansas, before recent diamond discovers in America’s Rocky Mountain region, was the only state in the United States that contained known quantities of diamonds. The twenty-five stars inside the diamond’s blue border represent Arkansas’s admission to the Union as the twenty-fifth state. The four inner stars’ meanings are more complicated. The star above the word “Arkansas” is now said to represent the Confederate States of America. The three stars below Arkansas have three separate representations. First, the three stars represent the three states Arkansas has been a part of: Spain, France, and ultimately the United States. Second, the three stars represent the year 1803, when the Louisiana Purchase made present-day Arkansas part of the United States. Finally, the three stars also recognize that Arkansas was the third state admitted to the Union from the Louisiana Purchase’s territory. Our lives changed forever on the morning of September 11, 2011, when terrorist attacks devastated New York City’s Twin Towers, the Pentagon in Washington DC, and flight 93 in Shanksville, Pennsylvania. Since September 11, 2011, countless troops have died in Iraq, Afghanistan, and other war zones around the world. Each year, on September 11, we honor the victims of the September 11 attacks and those troops who have sacrificed their lives for our safety. Since September 11, Americans have become increasingly patriotic and Online Stores has supported Americans in the military by donating flags, flagpoles, and pins, among other items. This year will mark the tenth anniversary of the September 11 attacks. Cities around the country are planning memorial events to honor the victims of the attacks and American troops in combat. 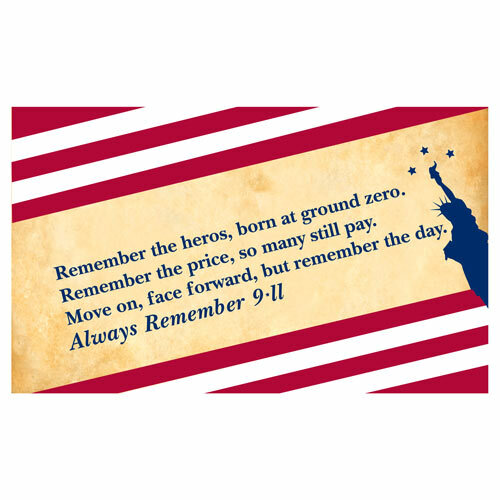 Online Stores has a variety of beautiful September 11 memorial flags to help you make the day more meaningful. The USA 9/11 flag is designed based upon the United States flag. 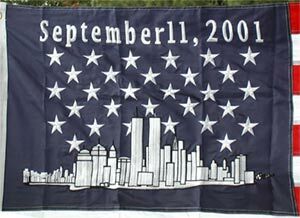 Instead of the traditional blue, fifty-star Union field, however, the USA 9/11 flag features an embroidered image of the New York City Skyline with the Twin Towers, white stars, and the date, September 11, 2011. The flag is 3’x5’ with sewn stripes and durable brass grommets. This flag is available in the large 3’x5’ size and a vertically oriented garden size. The 9/11 Remembrance flag features bold images of the New York City and Twin Towers skyline, red and white stripes disappearing into the horizon, and blue stars in the background. 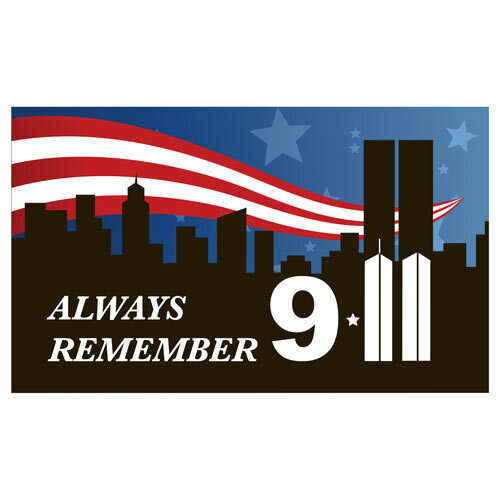 The words “Always remember 9/11” appear in the foreground of the flag, with the “11” designed to look like the Twin Towers. This flag is also available in 3’x5’ or garden size. 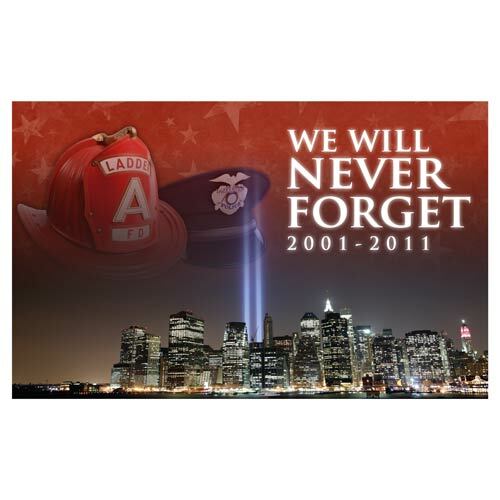 The 9/11 We Will Never Forget flag is specifically designed to honor the 10-year anniversary of the September 11 attacks. The nylon flag features a photograph of the New York City skyline in the foreground and images of a police hat and firefighter’s hat in the upper left corner. The text “We Will Never Forget 2001-2011” appears in the upper right corner in bold white letters. This flag is made from top quality fabrics and can be used inside or outdoors.